Spesso ci capita sia a casa che in ufficio di avere una sola presa di rete e due dispositivi da collegare, come telefono, modem, router, fax, computer, console. 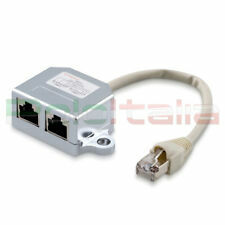 Tramite questo splitter di rete Ethernet è possibile ottenere due porte ethernet con un solo cavo. Si usa in coppie: è necessario un adattatore per ogni presa a muro. Entrano quindi due linee Cat 5e nel primo splitter collegato alla prima presa a muro. Nella canalina passa un cavo solo. Nella seconda presa a muro si collega il secondo splitter ed escono nuovamente due linee. L'adattatore "a T" infatti serve per sdoppiare un cavo di rete per ottenere da esso due porte RJ45. Per cui va utilizzata una coppia di adattatori per ogni cavo che si vuole sdoppiare. This is the original high quality Cat5e cable with standard color, twisted pair wires. 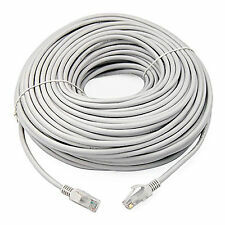 Great Chance to buy this original Cat5e cable at the best price ever! High quality Ethernet Network Cable with two RJ45 Connectors. Color: blue Material: PVC Long: approx 1.8M USB to RS232 Serial to RJ45 CAT5 Console Adapter Cable Cord for Cisco Routers Package Contents: 1 X FTDI USB to RJ45 Cable Note: Light shooting and different displays may cause the color of the item in the picture a little different from the real thing. The measurement allowed error is /- 1-3cm. Brand Unbranded MPN Does not Apply UPC 191466777800 EAN 191466777800 ISBN 191466777800. 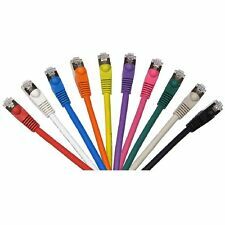 CABLE RESEAU ETHERNET DROIT RJ45 CAT 5E UTP 10 M mètres cordon livebox freebox . , Playstation 3, XBOX 360, Wii, PC, MAC etc. CÂBLE ETHERNET CAT5E UTP 10 mètres. Câble de qualité, 2 connecteurs RJ45 moulés. Applications: 10BaseT, 100BaseTX, Gigabit Ethernet. 1 x RJ45 Ethernet Network Coupler Adapter Splitter. Convert a single RJ45 outlet to two RJ45 sockets. Increases the number of RJ45 network connections on an RJ45 outlet. Interface: 1 input RJ45 port and 2 output RJ45 Ports. Spesso ci capita sia a casa che in ufficio di avere un cavo di rete di lunghezza insufficiente per collegare due dispositivi come telefono, modem, router, switch, fax, computer, console, e tanto altro. Grazie a questo adattatore di rete RJ45 non avremo più di questi problemi. Con l' accoppiatore modulare si crea, con molta facilità e velocità, una prolunga per cavo di rete Ethernet RJ45 di tipo dritto o incrociato. Tutti noi sappiano che unire un cavo di rete patch non è semplice, e anche quando si riesce si riscontrano rallentamenti, interferenze, ed altri disturbi dovuti alla legatura. 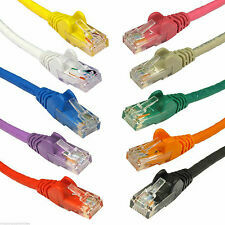 This Network CAT6 RJ45 Ethernet LAN Cable Patch Lead is made using premium materials to. High quality Ethernet Network Cable with two RJ45 Connectors. The RJ45 High Performance Category 6 UTP Patch Cable is the perfect performance upgrade. Câble de qualité pro : Blindage, 2 connecteurs RJ45 moulés. 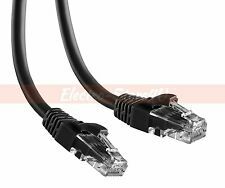 CÂBLE ETHERNET BLINDE CAT 6 E F/UTP 10 mètres. Applications: 10BaseT, 100BaseTX, Gigabit Ethernet. Replaces RS232 (DB-25/DB-9) serial port perfectly, connects to any laptop/PC's USB port directly to a console port like a charm. No more RS232 Female and male adaptersA must have accessory of routers, switches, firewalls and wireless LAN controllers with CONSOLE port, such as Cisco, Ubiquiti, Juniper, Fortigate, Mikrotik, TP-Link, Huawei, HP ProCurve devices and more. Our unique cable works flawlessly and quickly on laptop and desktop computerMicrosoft (HCL) to be compatible with Windows, no CD required for as the drivers are part of the OS distribution.Colour:lightblueMaterial:ABSProduct description USB2.0 (1.1 compatible); RJ-45 DTE Pinouts RTS(1), DTR(2), TXD (3), GND(4), GND(5), RXD (6), DSR(7), CTS(8). 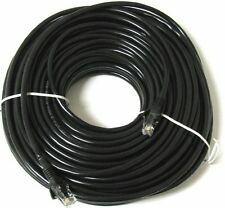 Cable length 1.8m / 6ft, Maximum RS232 speed 500kbau. Suitable for CAT6 and CAT 5E. 100x RJ45 Modular Plug Network Connectors Standard RJ45 network cable connector. Compatible with Standard RJ45 sockets. Gold Plated Pins inside Connectors. Pins Purity of copper wire higher than 99.99%. Cat5e RJ45 Crossover Cable. Connectors: RJ45 male to RJ45 male. They are also used to connect an XBox or any gaming console directly to the PC. Type: Crossover. FULL DUPLEX Crossover wiring spec. Verified for Gigabit Ethernet. Testato al 100% per reti Ethernet gigabit (10/100/1000). OBINA CAVO DI RETE CAT. Siamo Sicuri Che riusciremo ad accontentarti! Prodotto provvisto di certificati CE e RoHS da normativa CEE. 5 x RJ45 Ethernet Network Coupler Adapter Splitter. Convert a single RJ45 outlet to two RJ45 sockets. Convert a single RJ45 outlet to two RJ45 sockets easily. Increases the number of RJ45 network connections on an RJ45 outlet. Cat5e is capable of upto gigabit networking speeds (this is dependent on your network). Our cat5e cables are flexible and easy to install. Our kenable outdoor networking cable has a copper coated aluminum (CCA) core and so is ideal for network signals. 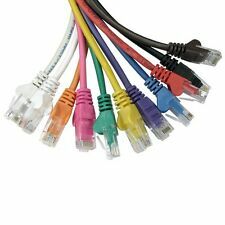 Lot de 10 fiches RJ45. Deux embouts RJ45. Une pince à sertir. Pour créer ou réparer un câble réseau Ethernet. Solide et de bonne qualité. Une longueur de câble FTP suffisante (mais pas trop longue). En général, on a 4 paires torsadées de couleurs . Ethernet Cable Comb Wiring Tool Data Centre Organiser Networking. Individual cables are loaded into the open slots of comb inner hub at any point within the run without the need to find and thread cable ends through closed holes. Suitable for OM4 and OM4 10G Multi-mode 50/125, Singlemode Duplex 9/125, and 10/40/100G multi-mode duplex installs. Connector Type: LC both front and back. Supports Single Mode (9/125) and Multimode (50/125) fiber cables.